Knowledge is a key factor for patients to engage in their own care and comply with their treatment regime.1 It is challenging for health care professionals to teach patients about their conditions and treatments as it requires understanding of complex concepts using medical terminology and can involve non-native languages. The use of photographs has been demonstrated to increase patients’ attention, comprehension, and adherence to their treatment protocols,2 and is a tool aimed at reducing the 50% non-adherence rate among those living with chronic illness and chronic wounds, which costs an estimated USD$100 billion/year (€80.3 billion/year).1 Using fluorescence images of bacteria to demonstrate proper wound hygiene provided this patient with the knowledge required to participate in his own care and advocate for himself through the wound care continuum. "No one had been cleaning in this crease. 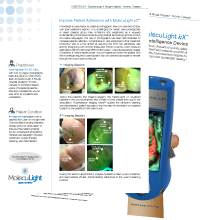 I have since imaged a couple of other patients with bacteria in creases and I asked them to take a picture of the MolecuLight i:X fluorescent image on their phone and show it to their nurse, so the nurse will know where to clean. It will make a difference." 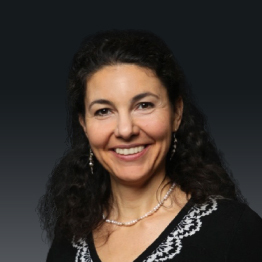 With over 19 years of experience, Rose leads the Save Our Skin (SOS) team at Scarborough & Rouge Hospital located in Toronto, Canada, to combat pressure ulcers of hospital inpatients. She also oversees the wound care clinic for inpatients and outpatients. 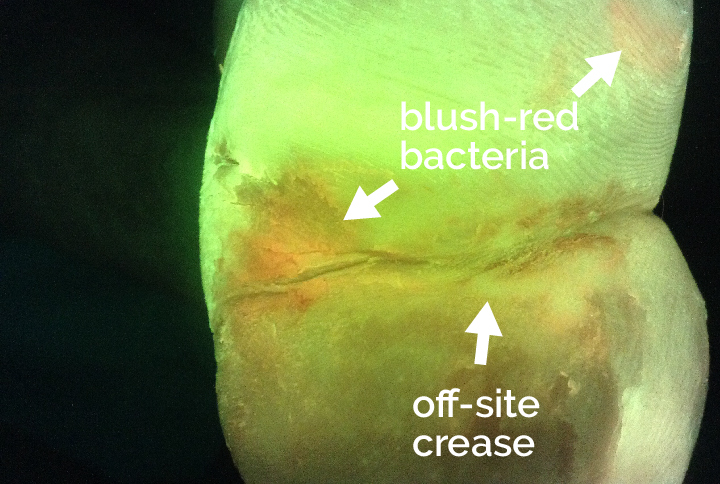 Patient Condition: 45 year old male patient with a diabetic foot ulcer on his right heel. 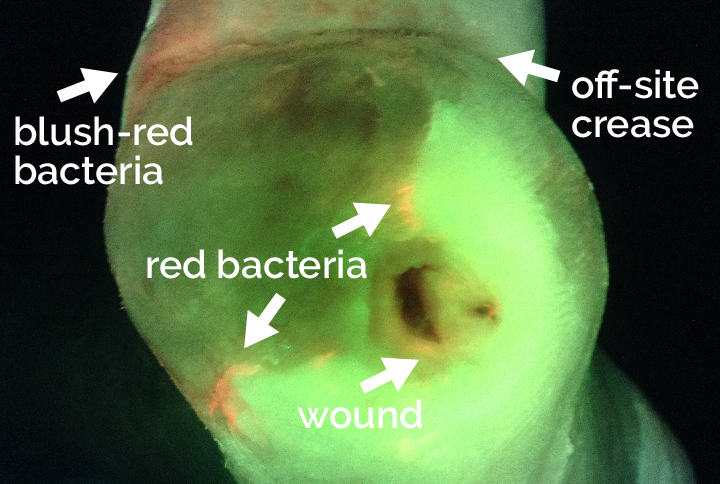 Comorbidities including diabetes, obesity, and prior amputation of toes, put this patient at higher risk for subsequent amputations. 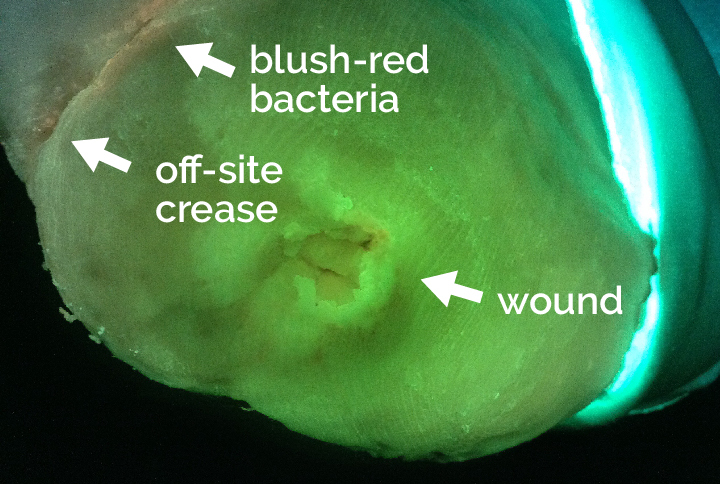 General care paradigm included hyperbaric oxygen therapy, cleaning, and debridement. 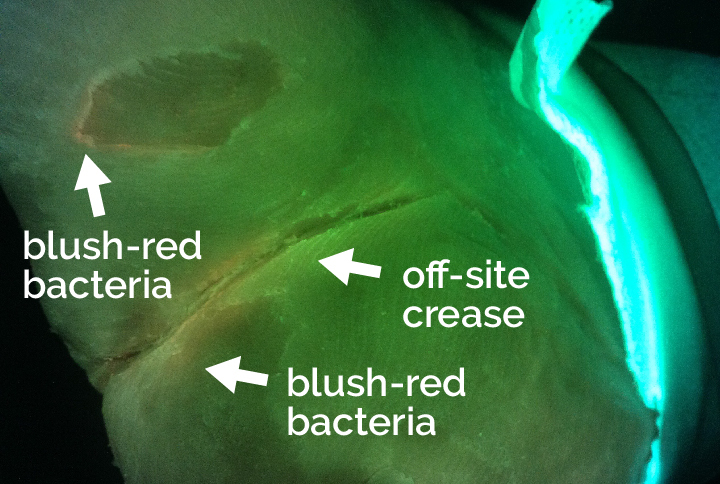 During this patient’s first imaging session, the MolecuLight i:X visualized bacteria in the wound periphery and off-site in a foot crease from a prior toe amputation. 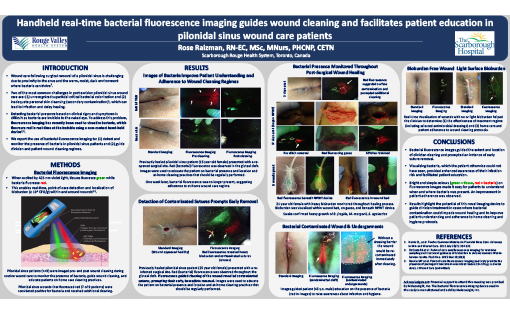 Fluorescence Imaging Mode™ guided the clinician’s cleaning and debridement, patient education, and the relay of information on bacterial location to the patient’s home care nurse. 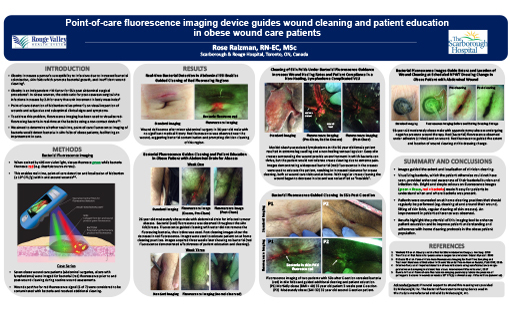 During the second appointment, FL-images revealed a clean wound periphery and less bacteria off-site, demonstrating adherence to the wound cleaning protocol. Gethin G. et al. Nursing Times. 2002 Apr 02;98(14):60. Houts PS. Patient Educ Couns. 2006 May;61(2):173-90.